IlyaM: This is position from my last game. I'm playing white. 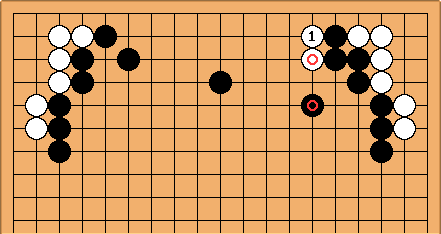 I considered that it is a time to enter black's area in the lower right corner and played . Black responded with and we played sequence showed in the diagram (actually was played at 'b' what is obviously an overplay but this is out of the scope of my question). My first question is about . 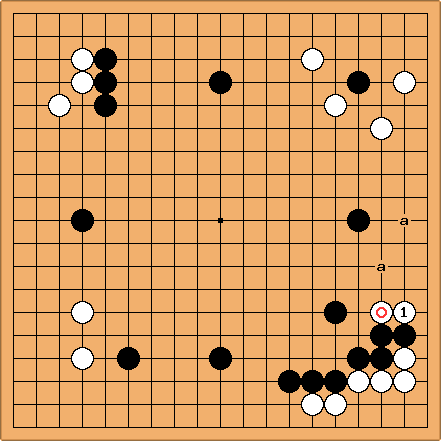 I was expecting it at 'a' like in 44PointOneSpaceLowPincerInvasionInterception joseki. When my opponent played I thought initially that it is an overplay so I was looking for refutation but I could't find any. 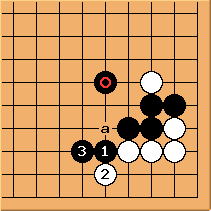 If I'm reading correctly even if I had all ladders in my favor playing at in the initial diagram and then cutting at 'a' if black responds at doesn't work. After game I've checked game databases and found that pros play in the initial diagram both at and at 'a'. Why and then they choose one of these points? Direct 3-3 invasion compared to game result. Dave: I think that there is still significant aji left in the White approach stone. 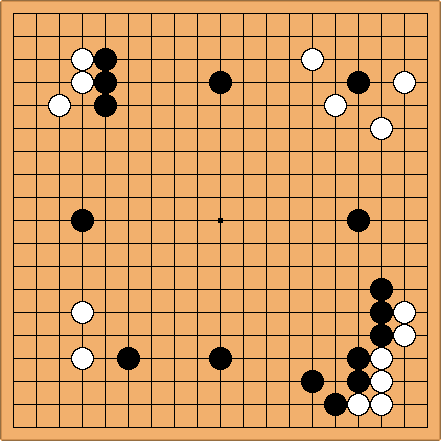 It starts with the typical descent at and can help White reduce or invade the area in front of Black's wall. dnerra: I agree 100%. The marked exchange is a clear gain for White. 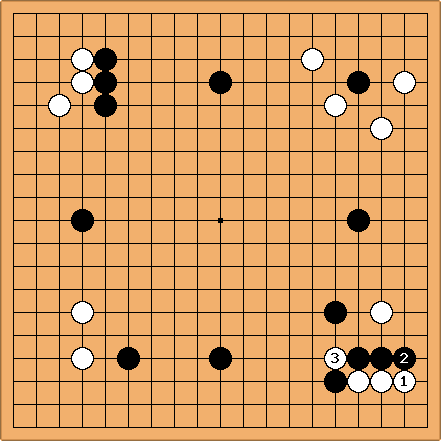 Dave: More importantly in this position, if White invades directly, Black will probably block on the wider side. The result (assuming this joseki results) is better for Black than in the game IMHO. ThaddeusOlczyk: First the double hane is perfectly fine. Blacks wall works well with Blacks moyo. dnerra: But White will play at , since the cut on the right of is not threatening anything. Then the Black stones along the lower side have lost much of their effect. IlyaM: Exactly, it is actually happend in the game a bit later. Done correctly Black can painfully demonstrate that there is more territory in the center than the sides. Second in variations where is played at a, it is because of the shortage of liberties in Blacks position created by the cut at a. The circled stone protects against the cut.